Oh the places you'll go and the people you'll meet! In years past I've been a roving reporter sharing with my online friends and family my view of the annual Houston International Quilt Market and Quilt Festival - and this year the exception is the majority of "my view" is from my booth at Festival...couldn't resist this photo of a passer-by-er ... a wonderful example of a good pack mule! what I don't know is if his wife went wild purchasing Christmas gifts or if he was restocking a booth...either way, I'd say he's a jolly good fellow wouldn't you?!?! Fun stuff wouldn't you agree? Since I'm not a retail or online shop a lot of items were just eye candy for me - a time to be inspired and learn new things and take a peek at the upcoming fabric lines from all the major manufacturers. I do however have my favorite vendors...because I teach beginning piecing and fun patterns in both my studio and area quilt shops I always make a bee-line to Aunties Two Patterns - boy did I buy out the booth! I can't wait to make some shop samples - check out their rag rug pattern and just one of my favorites - the breezy weave bag... this bag lady is going to be stylin' in 2012 that's for sure! And what market venture would be complete without stocking up on thread for the longarm (and piecing). Bob at Superior Threads always has a well stocked booth and that's generally where all the longarm guys and gals gather during market...this year was no exception. I stocked up on Rainbows and the new Omni line. Fun fun colors! 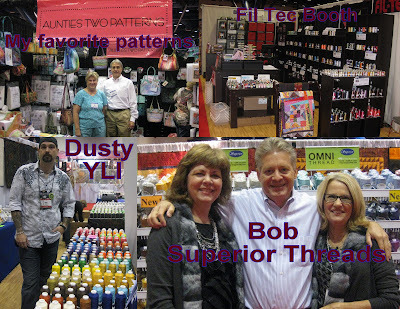 During Festival I visited the Fil-Tec booth where I purchase my Magna-Glide prewounds and met up with Dusty Farrell at the YLI booth where he was introducing his new line of thread...Yep, longarm quilters invest a lot in thread! 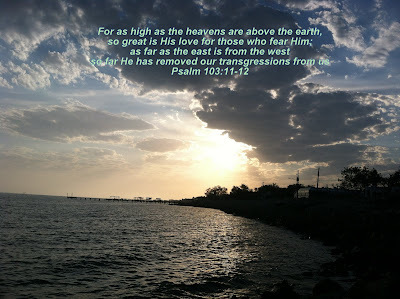 I think if you click on the above photo collage that it will become larger in your screen....at least I hope so. I'm trying to share a lot of photos in a little amount of space so I hope this works for ya'll. I've got things a little jumbled sharing vendor photos from Market and Festival mixed together but oh well... To get back into the chronological order of things - first things first! 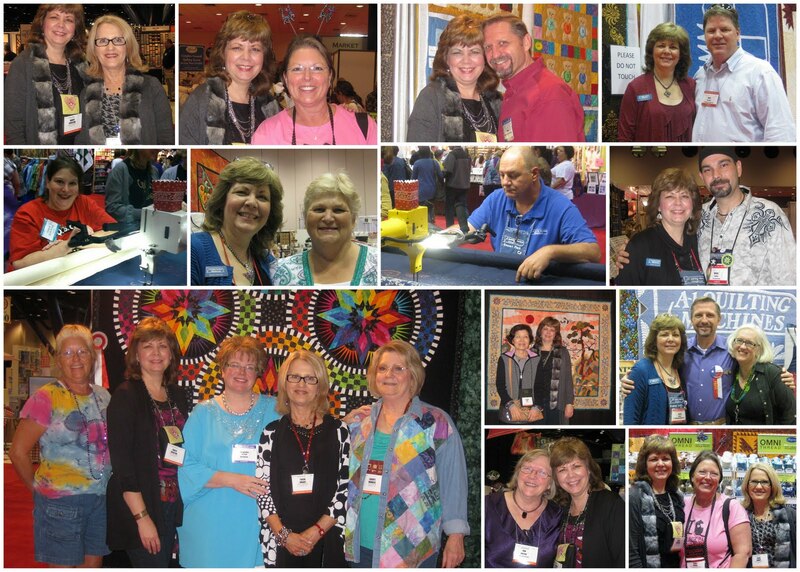 Market is not only a time for Trish and I to purchase things for our businesses but it's sorta a reunion with all our quilting friends, and a time to celebrate! The first person I ran into at Market was Tom Russell and we had a bit of celebrating to do! 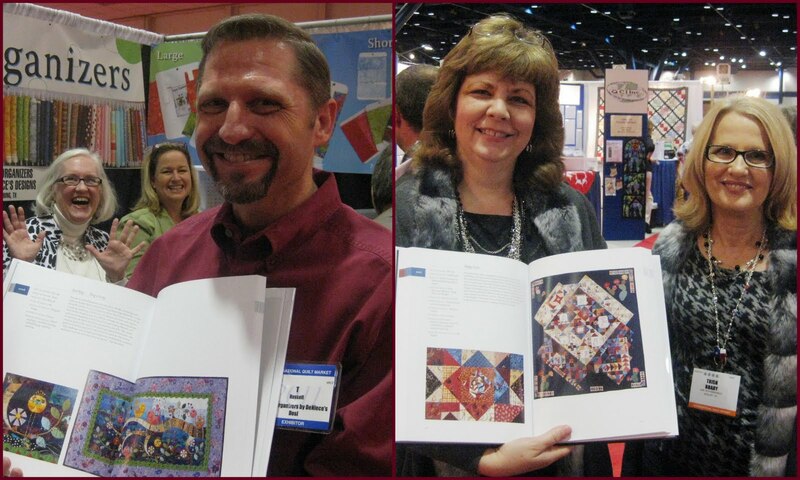 The new book Lone Stars III, A Legacy of Texas Quilts 1936-2011 was released and his quilt is on page 3oo and one that I quilted was on page 248. Woo-hoo! I didn't learn until after the fact that there was a reception for those included in the book, I didn't get the memo....so I missed the wine and cheese but I've still got my name in the book and that's what counts! All too soon Market was over and it was time to set up the A1 Quilting Machines booth for Festival. 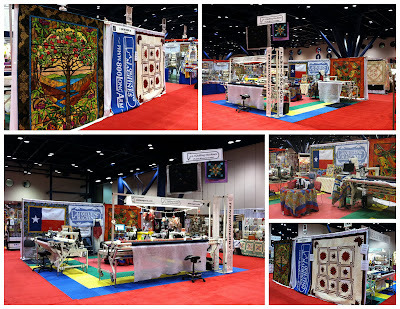 I do hope you can click on this and see the close ups of the beautiful quilts I borrowed from award winning quilters Mark Sherman from Florida and Clem Buzick from North Dakota. 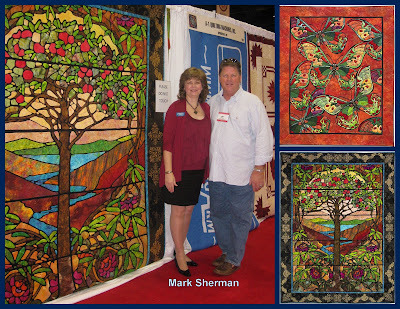 Here's a close up of Mark's quilts, and "me 'n Mark"
If you have never been to the Houston show you can't imagine just how big it really is! This is a view from an upper floor window. I have no idea the square footage of the show nor the number of the vendors, but in the past I do know the show boasts of over 56 thousand attendees! Truly a quilter's paradise! And plenty of other things to tempt those non-quilters too! This photo is not even half of the hall - the isles were numbered 100, 200 all the way to 2000 - so it's TEXAS BIG! 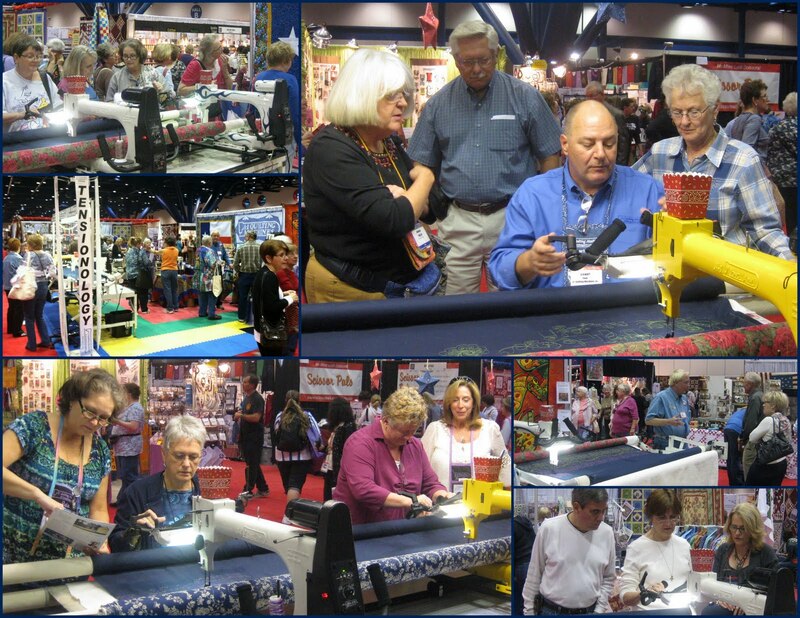 One of my favorite things is getting to introduce people to the joys of longarm quilting. 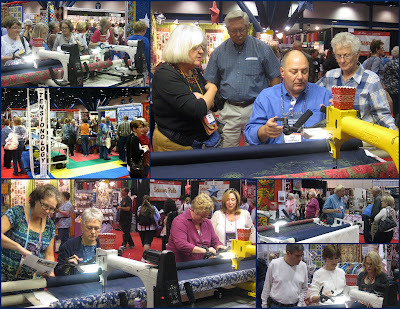 Many have never seen nor had their hands on a longarm - that's why we bring them to the shows, to allow people to try them out and see if this is something they might be interested in....many come to the show with an agenda to test drive all the major brands and then make a decision on which longarm is best for them. We welcomed many new A1 quilters to the family this past weekend! ... this is the first time I am SERIOUS about making a long-arm happen for me. You'll be hearing from me and that is largely due to the warm greeting you and the other reps (and customers!) gave me during the multiple stops at the show booth this weekend. I've now sewed on about everything - I want your machine. It's the one that wins hands down for control, smooth motion and value overall...and I've LOOKED!Cheers! I had a ball helping and would love to do it again along with all the other fun helpers! It always amazes me what all you learn even when just enjoying the A1 family at a show. Karen thanks so much for asking all of us to help. ... thank you for the opportunity to work in the booth and tell more people about how great the A-1 is. To be able to say, "I'm not a dealer, just a very happy customer using the best longarm. Just try all of the other longarms and you will not find a smoother running machine." Visiting with Stewart and (others) was a plus also. 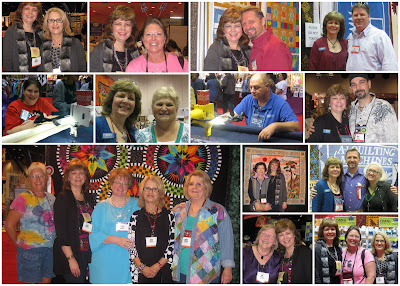 It was so nice to meet you and all the other A-1 quilters. I feel like I have found a family! Everyone was so nice and friendly. I am very excited and looking forward to getting my new machine! This is what makes those long days worth it that's for sure! I am so blessed to have the best machine out there, the best "boss" Stewart Plank, and the best customers! ...with my mom! 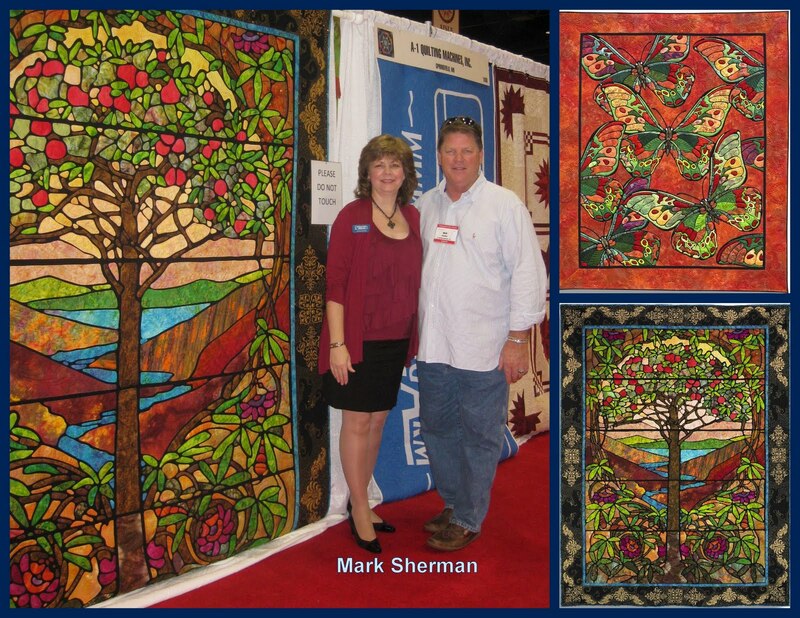 This was the first time she'd attended the Houston International Quilt Show and got to see first hand what I'm so passionate about! Thanks mom, for your continued love and support! 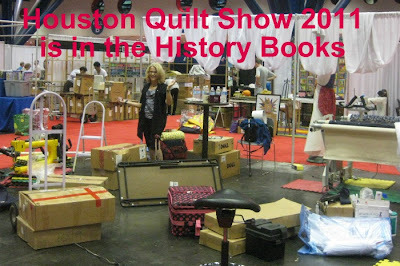 Before we knew it the quilt show was over. We were joined by Trish's husband Frank and my hubby Johnny to help tear down the booth....looks a little different doesn't it? I've always loved those behind the scene photos! SO here's the final parting shot from my full-time A-team volunteers Trish and Dwain...and yes, those are bags under our eyes - we are tired but most happy! It was a great Market/Festival - I'm still digging out and sorting through all the wonderful things I came home with from Market and busy answering emails from new customers and future customers who want to be put on a mailing list. OH! and I almost forgot! 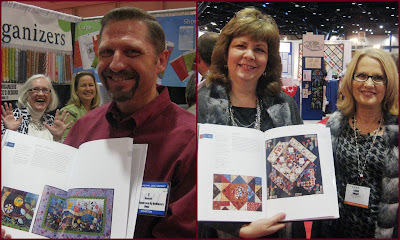 I was totally blown away by having some folks come to the booth to inquire about my quilting services - thank you to my fellow vendor friends who passed along my contact information! I'm looking forward to working on some very special quilts in the near future! Karen O Needs Your Help!